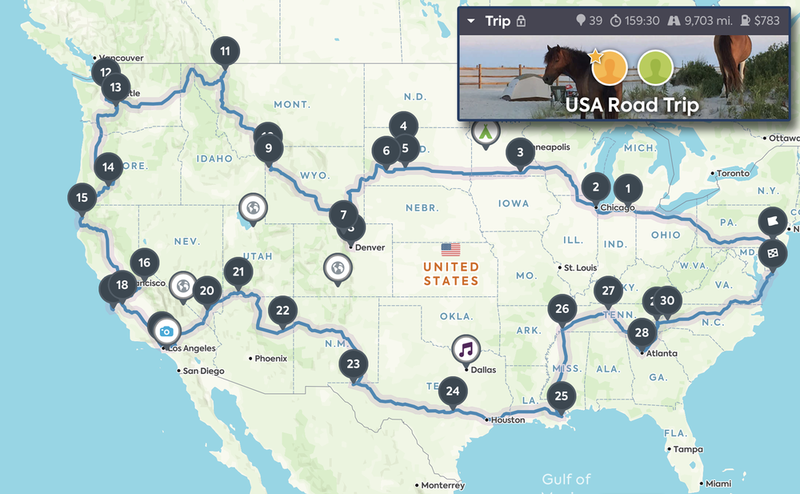 Today Sylvie and I head out on our cross-country road trip. We got married last week and didn’t even start planning this trip until just a few days ago. Our initial plan was to head south (from Philly) and then work our way west. Given the late start (mid September) we worried about not getting out west (and eventually north west) until late October…a region that is a bit cold that late in the year. Huge storm system hurricane Florence also nudged us to move west first. Almost 10,000 miles and 160 hours of driving time over 2 months would result in us having to average about 6 hours of driving every other day. Suffice it to say that we will be cutting out much of this route. We managed to travel through 37 countries spanning multiple continents and seasons in only a pair of 37L backpacks. Packing for this road trip proved to be quite a bit different. Our minimalist nature was constantly battling our survivalist instinct. On-the-road comfort and safety are paramount for this trip. Traveling through sparsely-populated areas in extreme conditions requires provisions we never had to worry about while traveling internationally. When backpacking the world we spent most of our nights eating out at restaurants and sleeping in air conditioned hotel rooms. On this trip we will be spending most nights in an ultralight 2 person A-frame tent [⛺️ provided by Six Moon Designs] (we will be reviewing this tent in a future post) and cooking our own meals using butane-powered travel burners. Camping Gear - tent, sleeping pad, hiking poles, pillows, down quilts, sleeping sheets, bug spray, hiking shoes, etc. Cooking Gear - cooler, butane stoves, cast iron pots/pans, utensils, fire starter, etc. Food Stuffs - rice, pasta, rice wraps, sushi paper, condiments, lentils, etc. Clothing - merino wool clothing for layering, packable down, fleece, jeans, hiking shoes, socks, exercise clothing, flip flops, etc. Games, Hobbies, Tools, & Misc - card games, kindle, movies (on computer), camera + lenses/gear, wood-splitting axe, flashlights, first aid kit, etc. Pack similar items together—put all camping stuff in a one container, food stuffs in another, clothing in a another. You can even parse out clothings for different seasons to really make packing/unpacking a (relative) breeze. Pack healthy snacks—we are all guilty of buying junk food while traveling. Our impulse control is at its weakest when we are hungry and tired so make sure you plan accordingly to avoid unhealthy habits. Binging on chips and chocolate here and there won’t be the death of you but things start to matter more when you’re on the road for months on end. Make it a lifestyle choice and not an decision driven by passing desire. 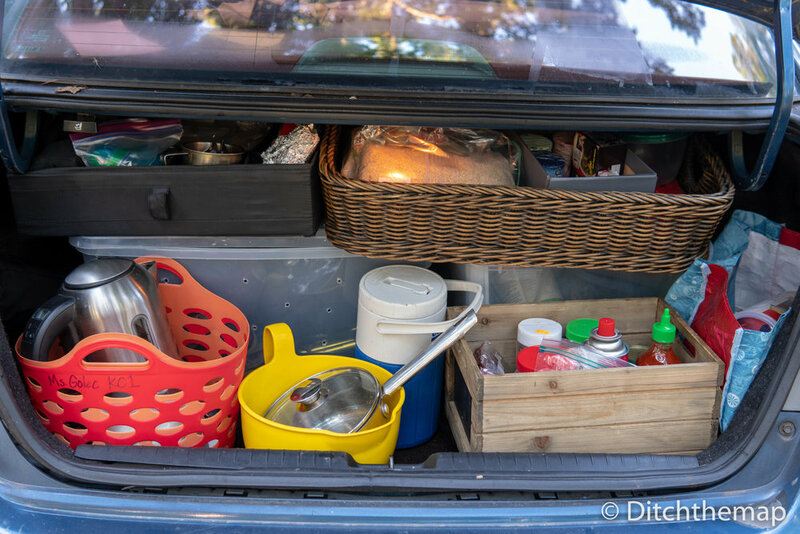 Have a quick-access stash—make sure to put a head torch or penlight [🔦 provided by Portland Coast], TP, quick snack, water, hand sanitizer, bug spray, first aid, and other items you don’t want to spend time riffling through your packed car.
. We know our trip will drastically change but this is our loose plan.